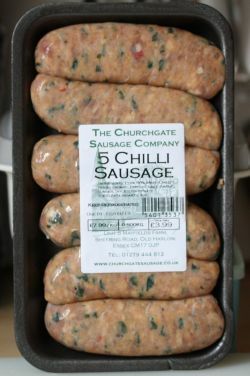 The Churchgate Sausage Company make some wonderfully scrummy sausages, and these 5 Chilli ones are blooming good too! Ok yes some chillies are hot but the combination Jason Drage puts together including some garlic, fresh ginger and parsley seems to produce a taste that is spot on without blowing your mind. Mind you yet again, even after 2 cups of tea afterwards I was still unable to taste the tea..! The bite and chew was very good needless to say, and the medium texture of the 80% pork in nice natural skins made for a really good foodie experience. 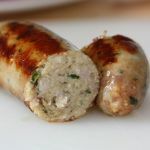 We tried these pan fried for the review and barbequed the remainder, with both methods producing a really good tasting result that you really should try at least once! Barbequed in a long roll with a light beer...the business! 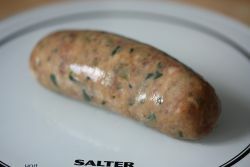 110x35mm before cooking, 105x34mm after. 86g before cooking, 82g after. That's a shrinkage of 3% & weight loss of approx 4%.